[S84] Benjamin Woodbridge Dwight Elder John Strong, Volume II, Page 1177. Eliza Jeanette Hunt was born on 10 July 1833 at DeRuyter, Madison Co., NY. She was the daughter of Joseph B. Hunt and Marietta Fairbanks. [S84] Benjamin Woodbridge Dwight Elder John Strong, Volume II, Page 1178. Susan Leavins was born on 10 October 1797 at Granville, NY. She married Lewis Hunt, son of Asahel Hunt and Anna Geer, on 8 August 1847 at NY. [S84] Benjamin Woodbridge Dwight Elder John Strong, Vol. II, Page 1178. Anna F. Hunt was born on 14 November 1835. 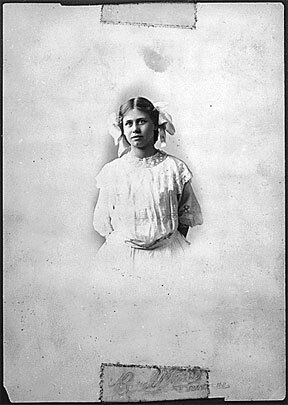 She was the daughter of Lewis Hunt and Mary Hall Sisson Gardner. Anna F. Hunt died on 11 April 1837 at age 1. Mary Hunt was born on 18 February 1839.1 She was the daughter of Lewis Hunt and Mary Hall Sisson Gardner. Josiah owned flour and lumber mills at Glenn's Fals, NY. Cynthia was still residing there (1870), a widow for 41 years. Elizabeth Spencer was born in 1602. She was the daughter of Gerard Spencer and Alice Whitbread. Thomas Gridley was born in 1612. He died in 1655. [S278] Thomas Boslooper, "Thomas Gridley." Levi and Addle were enumerated in the 1900 Harvard, McHenry Co., IL, federal census. He was in commercial sales age 37, she was 32. Children in the household were (?) 13, and Dorothy 8. Father-in-law George Ayer age 60 was also in the household. Adele and Dorothy were enumerated in the 1910 Evanston, Cook Co., IL, federal census boarding in the Greenwood Inn. Adele was 42, Dorothy 18. Gerald Rudolf Ford was born circa 1890 at MI.1 He married Dorothy Ayer Gardner, daughter of Levi Addison Gardner and Adele Augusta Ayer, in 1916. Gerald R. and Dorothy G. were enumerated in the 1920 Grand Rapids, Kent Co., MI, federal census, ED 73. He was a store manager age 30, she was. Children in the household were Gerald Jr. 6, and Tom. Gerald R. and Dorothy were enumerated in the 1930 Grand Rapids, Kent Co., MI, federal census, ED 70. He was 39, she was 38. Children in the household were Gerald R. Jr. 16, Tom 11, Richard R. 5, and James 2. Leslie Lynch King Jr. was born on 14 July 1913 at Omaha, Douglas Co., NE.1 He was the son of Leslie Lynch King and Dorothy Ayer Gardner.1 As of 3 December 1935, Leslie Lynch King Jr. was also known as President Gerald Rudolph Ford Jr. He married Elizabeth Ann Bloomer on 15 October 1948 at Grace Episcopal Church, Grand Rapids, Kent Co., MI. Leslie Lynch King Jr. died on 26 December 2006 at Rancho Mirage, CA, at age 93. 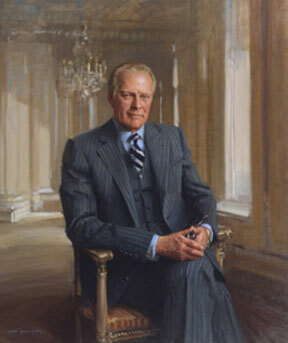 He was buried on 3 January 2007 at Gerald Ford Presidential Museum, Grand Rapids, Kent Co., MI. He died at home in Rancho Mirage, about 130 miles east of Los Angeles. He was the longest living president, followed by Ronald Reagan, who also died at 93. Elizabeth Ann Bloomer was born on 8 April 1918 at Chicago, Cook Co., IL. She married William C. Warren in 1942. Elizabeth Ann Bloomer and William C. Warren were divorced on 22 September 1947. Elizabeth Ann Bloomer married Leslie Lynch King Jr., son of Leslie Lynch King and Dorothy Ayer Gardner, on 15 October 1948 at Grace Episcopal Church, Grand Rapids, Kent Co., MI. 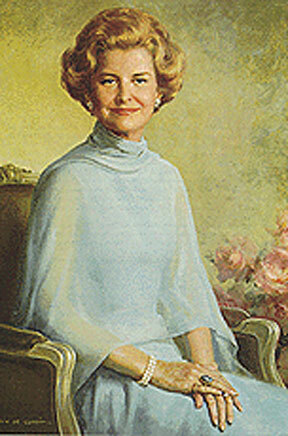 Elizabeth Ann Bloomer died on 8 July 2011 at Eisenhower Medical Center, Rancho Mirage, CA, at age 93. As wife of Gerald R. Ford, the 38th president of the United States and the only person to hold that office without first being elected vice president or president, Betty spent a brief, yet remarkable time as the nation's first lady. But after he left office and even after his death in 2006 at 93, she had considerable influence as founder of the widely emulated Betty Ford Center in Rancho Mirage for the treatment of chemical dependencies. After the 1929 stock market crash, when Ford was 14, she began modeling clothes and teaching children dances such as the foxtrot, waltz, and big apple. She also entertained and worked with children with disabilities at the Mary Free Bed Home for Crippled Children. She studied dance at the Calla Travis Dance Studio, graduating in 1935. When Ford was 16, her father died of carbon monoxide poisoning in the Bloomers' garage while working under their car, despite the garage doors being open. In 1936, after she graduated from high school, she proposed continuing her study of dance in New York City, but her mother refused. Instead, Ford attended the Bennington School of Dance in Bennington, Vermont, for two summers, where she studied under Martha Graham and Hanya Holm. After being accepted by Graham as a student, Ford moved to Manhattan’s Chelsea neighborhood and worked as a fashion model for the John Robert Powers firm in order to finance her dance studies. She joined Graham’s auxiliary troupe and eventually performed with the company at Carnegie Hall. Her mother opposed her daughter’s choice of a career and insisted that she move home, but Ford resisted. They finally came to a compromise: she would return home for six months, and if she still wanted to return to New York at the end of the six months, her mother would not protest further. Betty became immersed in her life in Grand Rapids and did not return to New York. Her mother now married family friend and neighbor, Arthur Meigs Goodwin, and Betty lived with them. She got a job as assistant to the fashion coordinator for a local department store, Herpolsheimer's. She also organized her own dance group and taught dance at various sites in Grand Rapids. In 1942, she married William C. Warren, who worked for his father in insurance sales, and whom she had known since she was 12. Warren began selling insurance for another company shortly after, later he worked for Continental Can Co., and after that Widdicomb Furniture, and the couple moved frequently because of his work. At one point, they lived in Toledo, Ohio, where she was employed at the department store Lasalle & Koch as a demonstrator, a job that entailed being a model and saleswoman. She worked a production line for a frozen food company in Syracuse, New York, and once back in Grand Rapids returned to work at Herpolsheimer's, this time as "The" Fashion Coordinator. Warren, an alcoholic, was in poor health and just after Betty had decided to file for divorce he went into a coma and she took care of him for another two years as he convalesced; they finally divorced on September 22, 1947, on the grounds of "excessive, repeated cruelty". They had no children. After Gerald’s election, the Fords moved to the Virginia suburbs of the Washington, D.C., area and lived there for 25 years. Gerald rose to become the highest-ranking Republican in the House, then was appointed Vice President to Richard Nixon when Spiro Agnew resigned from that position in 1973. He became president in 1974, upon Nixon's resignation in the wake of the Watergate scandal. Betty and Gerald Ford were among the more openly loving and intimate First Couples in American history. Neither was shy about their mutual love and equal respect, and they were known to have a strong personal and political partnership. Sergeant John Griffin married Anna Bancroft on 13 May 1647. Anna Bancroft married Sergeant John Griffin on 13 May 1647. Deacon Michael Humphrey was born on 20 November 1703 at Simsbury, Hartford Co., CT.1 He was the son of Deacon John Humphrey and Sarah Pettibone.1 Deacon Michael Humphrey married Mercy Humphrey, daughter of Jonathan Humphrey and Mercy Ruggles, on 15 September 1735 at Simsbury, Hartford Co., CT.1 Deacon Michael Humphrey died in 1778. Abigail Griswold was born on 29 April 1770.1 She was the daughter of Nathaniel Griswold and Abigail Pinney.1 Abigail Griswold married Captain Amasa Humphrey, son of Hezekiah Humphrey and Amy Cornish. Mary Humphrey was born on 4 January 1753. She was the daughter of Hezekiah Humphrey and Amy Cornish. Mary Humphrey married Capt. Bartholomew Case, son of Thomas Case and Elizabeth Woodford. Mary Humphrey died on 10 May 1818 at age 65. [S59] Ruth Cost Duncan, John Case, Page 74, Item 164. Lieutenant Nathaniel Humphrey was born on 20 May 1735 at Simsbury, Hartford Co., CT. He was the son of Esquire John Humphrey and Lydia Reed. Lieutenant Nathaniel Humphrey married Maria Humphrey, daughter of Charles Humphrey and Hepzibah Pettibone, on 2 January 1755. Lieutenant Nathaniel Humphrey died in 1822. Asenath Humphrey was born in 1765. She was the daughter of Major Elihu Humphrey and Asenath Humphrey.1 Asenath Humphrey married David Phelps, son of Capt. David Phelps and Abigail Griswold, before 24 March 1792. Asenath Humphrey died on 1 October 1825.